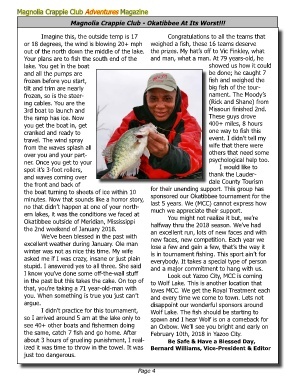 Magnolia Crappie Club - Okatibbee At Its Worst!!! 3rd boat to launch and                                                       Missouri finished 2nd. ner. Once you get to your                                                    psychological help too. no that didn’t happen at one of your north-          much we appreciate their support. stupid. I answered yes to all three. She said        and a major commitment to hang with us. the same, catch 7 fish and go home. After            February 10th, 2018 in Yazoo City.